Happy Ugadi to one and all. 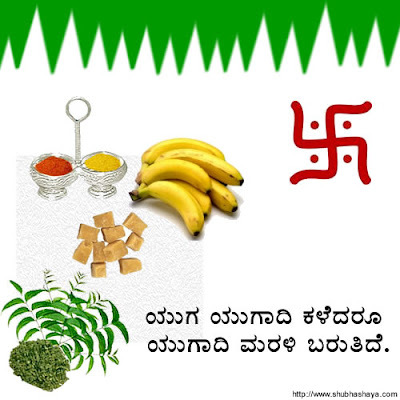 Ugadi marks the beginning of the New year Lunar Calender of Hindus. We have a cycle of 60 years, and each of them have a specific name and the year which we will be ushering in is the Sarvajith year. A year where we will triumph in everything we venture! I had written about importance of Ugadi here last year. Needed info on Ugadi as i am working on a project for this. Can you give me the entire poem in kananda. Me is a new Blogger to yor Blog! Happy Ugadi to you too..! @ Zoheb, Its Kannada not "kananda". I've written about it recently.